AGA has long been known for delivering great design, outstanding functionality and, in recent years, cutting-edge technology. 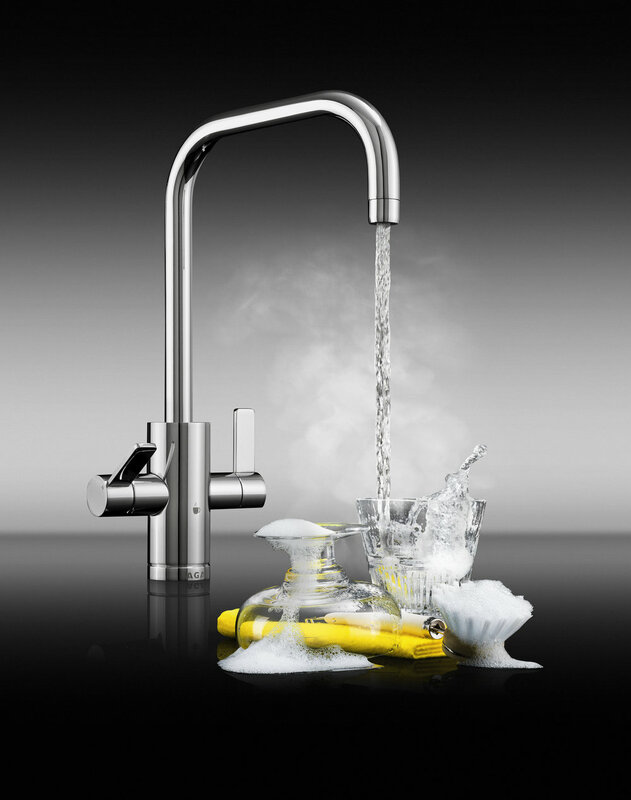 Now the range has been extended to take in a collection of innovative kitchen taps. The AGA 4-in-1 Tap offers all the benefits of a kitchen mixer tap but with the addition of PH balanced, limescale-free, filtered cold water and filtered steaming hot water, meaning you can make the perfect cup of tea in an instant. Capable of delivering more than 100 cups of tea per hour, the steaming hot water is delivered safely by the use of an innovative child safe magnetic HotFob placed on the front of the tap. These beautifully engineered taps are available in two styles - Modern and Traditional - and two finishes - Chrome and Nickel, not only do they perform brilliantly and look stunning, there's also a design that's perfect for every kitchen style. Discover the new AGA 4-in-1 Tap Collection which offers all the benefits of a kitchen mixer tap but with the addition of PH balanced, limescale-free, filtered cold water and filtered steaming hot water. View this video to learn more. Dual filtered cold and steaming hot water. Controllable 80°C - 98°C steaming hot water, no spitting or spurting and ideal for speciality tea. AGA HotFob child safety feature to prevent accidental scalding. Two design styles - Traditional and Modern, each available in two finishes - Chrome and Brushed Nickel. Three litre boiler to deliver over 100 cups per hour. An innovative feature of the AGA 4-in-1 Tap is the magnetic HotFob. When this device is placed over the logo at the front of the tap it activates the hot water function. It can be stored out of the reach of children, meaning they will never be able to accidentally turn on the hot water function. AGA is offering a nationwide fitting service and the taps can be installed as part of a larger kitchen project or retro-fitted to an existing sink and - whichever style you choose - you can be sure of impressive functionality and stylish good looks. Superbly engineered, exquisitely finished and using patented technology, the AGA 4-in-1 Tap Collection is designed and manufactured in the UK to the highest standards and comes with a five year warranty on the tap, two year warranty on boiler.